I am a tomboy through and through, always had my truck, never wanted a little car.. but then i became a mom and got ......A MINIVAN!!! Oh My GOD i bought a minivan! I was 20 years old driving a minivan! what!?! I can't do anything to a minivan to make it nicer, all i can do is slap a sticker on it saying "soccer mom" lol which was not me. Well i have now been in a van for 8 years, and i have to say I LOVE MINIVANS! Yeah they may not look cool, but wow they can do it all. 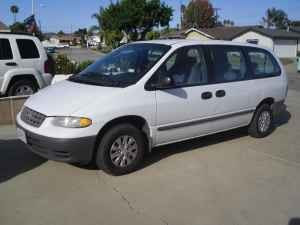 While the minivan is not the best thing to look at, it does allow for me to have all my family and friends in one vehical, does have some horse power to it, and it gets great gas mileage for how many it can hold. I love to go on vacations with it, we had gone while one of our children was in diapers and instead of pulling over cause a major poo i was able to get up from my seat move to the back, change the diaper place the child back in their seat, without stopping! It was great! I totally agree with you. Minivans are must-haves for moms. Although minivans have a reputation of being plain-looking, there are many things that make it a good family vehicle. One is it has space for the kids and family members, and plenty of room for your luggage and parcels. Since it is family car, it puts emphasis on the safety of its passengers. It has standard dual front and side air bags and latch child-seat attachments in the rear seats.